A Minute 2 Win It! 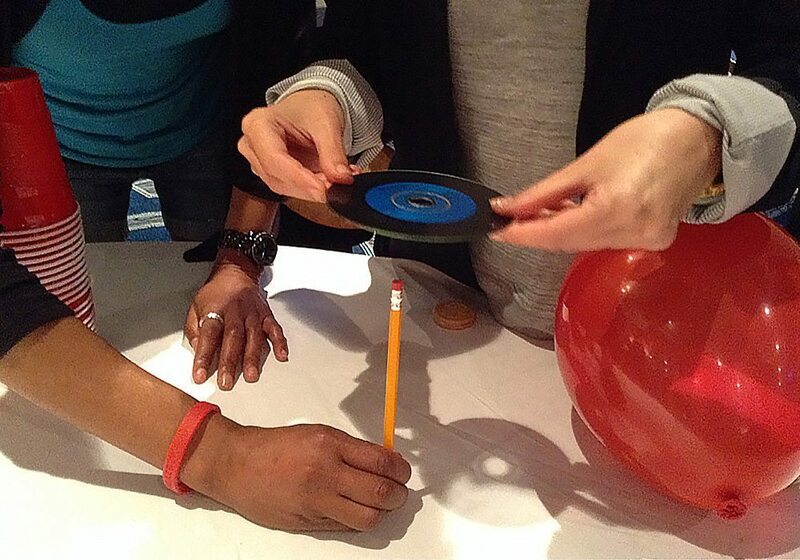 is a series of tabletop team building games using everyday household items and office supplies. After a fun demo and practice session, each challenge is played and teams are scored accordingly. Great for daytime or after dinner entertainment, this fast-paced event will have everyone laughing, cheering and vying to become A Minute 2 Win It! champions. 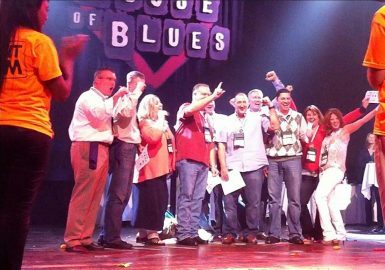 After an energizing kick-off, your group will be formed into sub-teams. Multiple rounds are played using a three-step system of demo, practice, and competition. 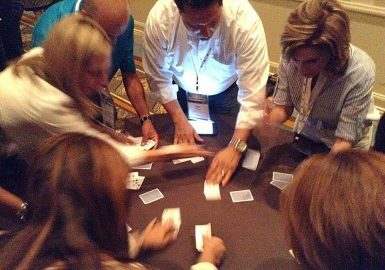 Teams are constantly engaged and focused on continuous improvement in an attempt to maximize their score. 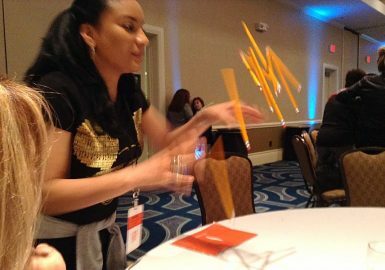 Examples of challenges may include: Back Flip – tossing and catching an ever-increasing number of pencils, Moving on Up – a fun cup stacking activity, Card Speed – a race to put a shuffled deck of cards in a specific sequence, and more! Our unique scoring system keeps the energy flowing and the teams in the thick of the competition throughout the entire event. The program finishes with an exciting awards ceremony where individual challenge winners are announced leading to the overall gold medal A Minute 2 Win It! Champions. This is one of our most competitive events and works as a perfect addition to any corporate or social gathering or as a stand-alone activity. A Minute 2 Win It! can be conducted in almost any event setting! To ensure a great experience, aspects of this program may be modified for your group size, group makeup, time available, and other variables. A Minute 2 Win It was the best team building event we’ve ever had here at Samsung Semiconductor, according to our participants! It was well organized, the communication exercise was a real team builder and the games were fun. Our group loved it. Honestly, everyone seemed to LOVE the program and really enjoyed the afternoon. The activities did not make anyone feel uncomfortable and overall people were smiling the whole time. It truly was a great experience. Your lead facilitator and his staff did a great job getting people motivated and involved. Again, thank you so much for all your help in coordinating such a fun afternoon. We truly appreciate it. It was a great event and we really appreciate that your company was able to come back, with the same facilitator, and administer the “A Minute 2 Win It!” event again for us. Our new group loved the exercises and had a great time! We look forward to working with you again. Thanks! The variety in the Minute to Win It games and the quick pace caused everyone to have a great time. The entire group was very involved almost too much to the point where a couple of times the facilitators had to calm them down a little bit so they would hear the appropriate instructions. Your facilitators did a very good job in running the event and bringing the crowd back around. 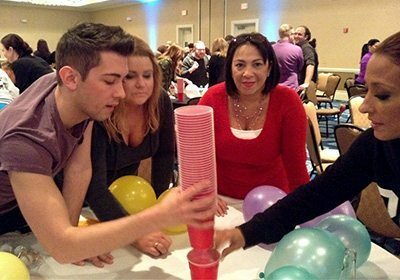 We contracted your company for A Minute To Win It team building activity for one of our clients. We weren't familiar with anything like this. Naturally, I had lots of questions and was a bit anxious. Your salesperson was quite patient, taking me through the variety of activities and together we chose an activity that was perfect for our group. The payment process was easy and he was regularly in contact with me. I spoke with the facilitator a couple of times beforehand and he too was great in answering my questions and calming my nerves. Yesterday, he was professional, on time, flexible and the event more than exceeded my expectations. I appreciate your team and wanted you to know you have some great people working there. Thank you so much for such a great event! Our group was engaged and excited about participating in A Minute 2 Win It!, which is not easy to do with a group of men. Everyone had a blast and several people came up to me afterwards expressing their enthusiasm with the event. Your lead facilitator had an awesome sense of humor and was able to play off the various personalities in the group and get everyone fired up! 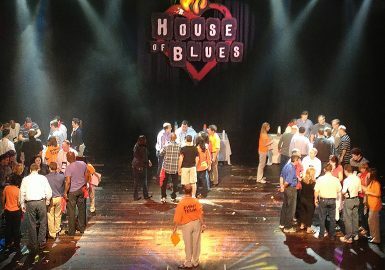 I definitely recommend this program to anyone looking for a team-building event that allows people to just relax and break their walls down for a bit. The games were simply enough for all age groups and allowed for everyone to participate in a fun game that accomplished all of our goals. Thank you so much for accommodating us on such short notice. Thanks again! Our A Minute 2 Win It program was a hit and your Lead Facilitator and his team were wonderful. Big kudos to your company for being so patient and accommodating with our time issues. Thanks! The A Minute 2 Win It event was great! Everyone had lots of fun, which was the objective we were looking for. We’ll definitely be working with your company again. Thank you! I just wanted to take a minute to reach out and let you know how happy we were with last week’s event! Your team did an absolutely AMAZING JOB with our group, and exceeded our expectations. They were engaging, funny, personable, and most importantly everyone in the room had a great time with them. Your lead facilitator was a pleasure to work with through the entire process, and I couldn’t be happier with how he led the group! A true professional that is gifted at what he does! We hope to work with you guys again soon. Our experience with Best Corporate Events and our Minute 2 Win It! event was phenomenal. The event was well coordinated and full of just the energy that we were looking for. I personally enjoyed working with your lead facilitator and appreciated his flexibility. I can say that we have only heard great things from each and every team member who has provided feedback to our department. We would absolutely recommend your services to others. Our A Minute 2 Win It event was a great success! Your lead facilitator did a phenomenal job at connecting with the student participants and keeping their engagement high throughout the event. We look forward to future events with Best Corporate Events! Thank you very much! The A Minute 2 Win It! program you delivered for our group was awesome. My leadership expressed how pleased they were with the event and said they would definitely want to bring your organization back. Thanks! The energy of the room was contagious and your lead facilitator was the captain of the ship. Our A Minute 2 Win It! event was great! Thank you for making our meeting kickoff such a great success. 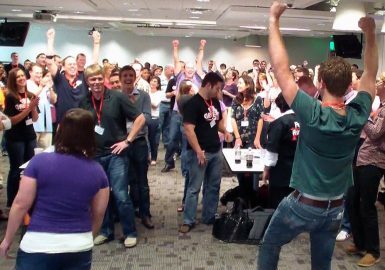 A Minute 2 Win It games brought our teams together and excited them throughout your program. Your team concept was an amazing way to introduce our players to one another. Our A Minute 2 Win It program was excellent; everyone is still talking about it. The card game at the beginning of the event was a great team builder and the tower activity was the really fun. Your lead facilitator was fabulous! A Minute 2 Win It was a great competitive team building program. All the games were exciting and everyone had a blast. Your lead facilitator was awesome!!! We all had a great time. Jennifer, Mackoul & Associates, Inc.
Our group really enjoyed A Minute 2 Win It! It was very organized event and we all had fun! The best part of the event was the kick off and how it got everyone engaged. We can't wait until our next team building program with BCE next year! We received great feedback from our teams. They all enjoyed their A Minute Win It event! It was extremely well organized and I think all areas of the program were fun. Everyone was engaged and cheering on their team-mates. Thanks for everything! Our A Minute 2 Win It program was very organized. We are an international company, so the best team building aspect of the program was getting to know each other for the first time. Our group enjoyed all the activities especially ping-pong and back flip. Thank you so much. The Chili Cook-Off and A Minute 2 Win It! events went very well and your lead facilitator was a pleasure to work with. We were also glad that she was able to do both events. We really liked how she put the teams together (20-30 minute prep) as it forced the people to mingle with people they didn’t know. We would definitely use Best Corporate Events again in the future. Thanks for all your help! 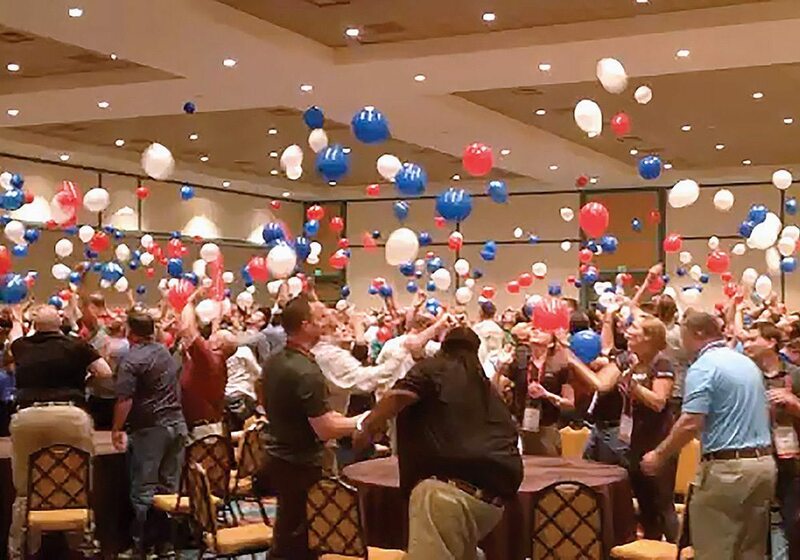 Just a short e-mail to say thank you for a great “A Minute 2 Win It!” event in Orlando. You and your team did a great job and the format and underlying learning and messaging were great. Had a lot of good feedback on the session. Keep up the good work. Our group really enjoyed the activities in A Minute 2 Win It! I liked the opener too. Your lead facilitator had our people find someone they didn't know and answer silly questions. It was a fun way to break the ice! Your staff had great energy and were flexible when we had to change format at the last minute. Next year we want to do a SmartHunt. Everyone had a blast and they were still talking about how much fun they had the next day at work. It was a great team building experience and made us want to do it again. We loved the Oreo Cookie challenge. We like to do another team building program in nine months. Our A Minute 2 Win It! team building event was very organized. The most fun part of the program was the opening Entourage activity. As a whole our group loved the activities and your lead facilitator’s energy. Thanks again for another great event! The "friendly" competition between teams was the best part of the night - the teams had to be #1. Each game was fun, but the Oreo cookie challenge gave us all the most laughs. Your lead facilitator did an awesome job - the way he interacted with the team and even dealt with a few "smart asses" was wonderful. He kept things moving at a great pace and from start to finish it was wonderful. 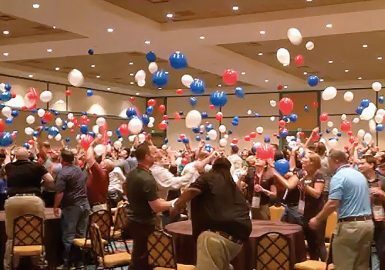 I have only received positive feedback from the A Minute 2 Win It event last night and today everyone is telling me how much fun they had. The initial icebreaker for our A Minute 2 Win It program was really fun and set the temperature for the entire event. Your lead facilitator had the perfect personality - he handled our group very well. The program was extremely organized and a great team building activity because it really made us work together. Everyone enjoyed the activities. Our Minute 2 Win It event was a fun team competition. The program was very well organized and the icebreaker and timed challenges were a great team builder. Our group as a whole gave it a 9.9 out of 10! Your facilitator delivered an extremely organized Minute 2 Win It event for our group. Learning about peoples differences and their strengths was a great team builder. The activity I thought was the most fun was the pencil flip. As a whole, I think our group really enjoyed their program. It was great that everybody was really able to work together to figure out their own strategies. The Entourage icebreaker really got everybody going! It was definitely out of the box, but I think that's what people liked about the activities the most. A Minute 2 Win It was something completely new for my team, who usually strays away from the 'typical' team games, but it was well worth it in the end! The minute to win it games were great. The group loved the ice breakers! Our facilitator was great on the mic and had great enthusiasm. The best aspect of the program was the result of the event bringing closer relationships amongst our group! The rock paper scissors was fun!! Nothing but raves! Our facilitator was fun and had the ability to herd the cats!